BioShock Infinite has three times more dialog in one level than BioShock had in its entire campaign. 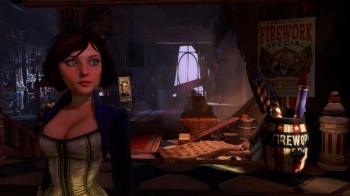 This is largely because BioShock features two central protagonists: former Pinkerton agent, Booker DeWiit, and googly-eyed, human hourglass, Elizabeth. They're a talkative pair, judging by the footage we've seen so far. BioShock, on the other hand, had Jack: an angry mime who expressed most of his feelings with a wrench. And a golf club on one occasion. "When I first came up with these characters Booker and Elizabeth talking to each other and interacting with their world, I didn't consider how much writing that was going to be," explained creative director and writer, Ken Levine. "Just one level of BioShock Infinite writing and the amount of character interaction we have is probably three or four times as much writing as in all of BioShock 1. Levine also mentioned some of the difficulty involved in telling a compelling story without sacrificing the game's interactive elements - he's not a fan of cutscenes. "You fight against the suspension of disbelief as soon as you lock a player in place or start moving him along without the player controlling it," he said. "So you come up with certain rules, like, if there's ever a moment where the player is locked to the ground, there must be some context. We don't just lock a player's feet to the ground. There has to be a reason why they can't move - they're using a machine or something." Without giving too much away, BioShock had an excellent rationale for taking control away from the player. I imagine Levine will come up with something. BioShock Infinite arrives on October 19th. Now, would you kindly click that like button?